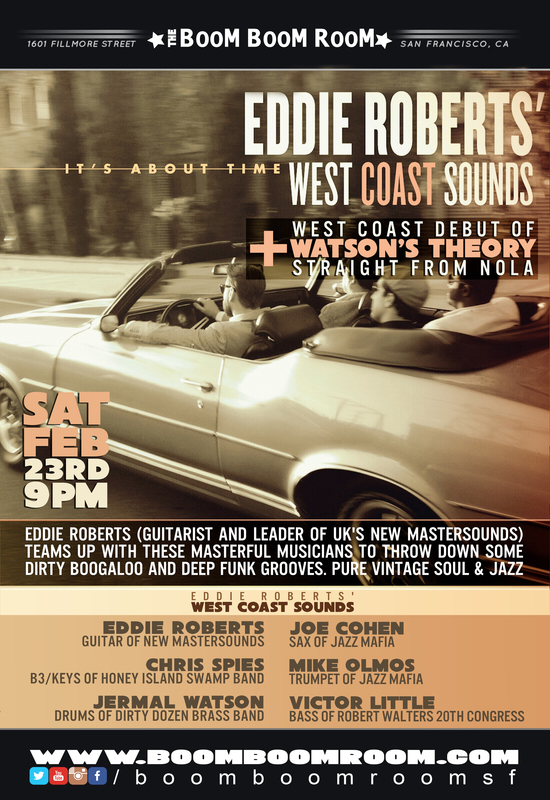 West Coast Sounds is more than simply a band name for soul jazz guitar maestro Eddie Roberts’-it’s literally astatement about where he’s going in his extraordinary life. It’s about the Welsh native and long time Leeds, U.K. resident manifesting his talents and thriving, writing songs in his favorite city-San Francisco. The globe trotting founder of the New Mastersounds had visited many a metropolis, but he couldn’t get the City by the Bay or its hip music fans out of his head. In 2012, Roberts packed his gear and headed west for good. He reconnected with Hammond B3 virtuoso and Boom Boom Room stalwart Wil Blades. He found drummer Jermal Watson (Dirty Dozen Brass Band) on this year’s Jam Cruise. When Jazz Mafia horn players Joe Cohen (tenor sax) and Mike Olmos (trumpet) guested on the New Mastersounds’ album Outon the Faultline, Roberts had an epiphany.